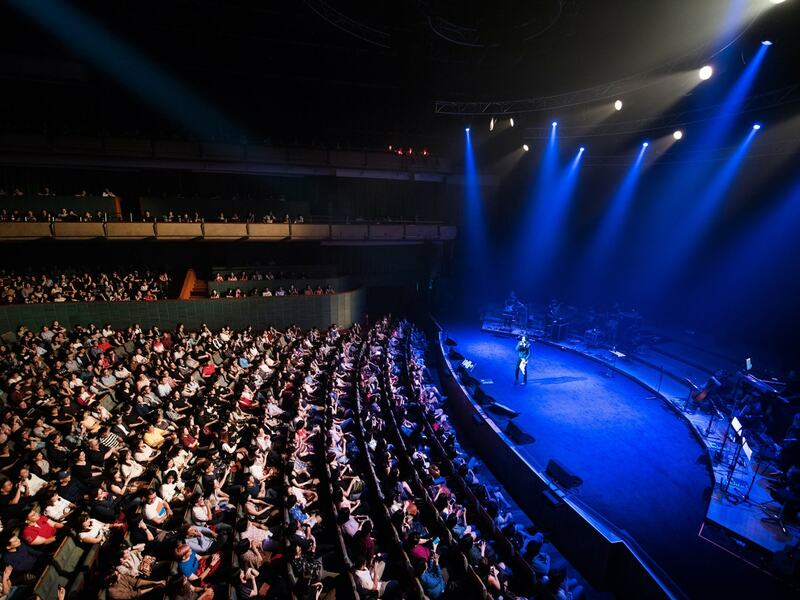 Spotting wavy hair reminiscent of Eason Chan – the image for his latest best-selling album Sell Like Hot Cakes2 – Yoga Lin electrified the 1600-strong Esplanade Concert Hall to its feet. After four years of absence, he returned as the opening act of the Huayi Chinese Festival of Arts. This mini-concert came as an interjection to his The Great Yoga concert tour, with a brand-new program to explicitly cater to his long-awaiting Singaporean fans. Despite the popular and critical acclaim3 – with MVs made for nine of 11 songs – only three of the album’s songs were performed. Instead, Yoga drew heavily on his deep repertoire of hits from five studio albums and live covers. With mild resignation, the first winner of the pioneer Taiwanese singing competition One Million Star4 lamented that a live TV performance gains more attention than his album does. He was referring to Step Aside5, a ballad cover he sung in a full panda costume on Mask Singer6 in China. Yet his recent litany of film and TV soundtracks7 suggests that Yoga has grown to adapt his music to cater to needs other than his own, and much of this transition is made during his year in conscription. His last single before enlistment was Speaking In Tongues8, a highly experimental rock single which he composed, lyricized and co-produced. It came on the heels of much negative publicity following the split and public fallout with GEM Tang, who rode on the groundswell of popularity from her successful stint on I Am A Singer9. Then Yoga, best-known for his lovelorn songs, said, “If someone asks after listening, “What the hell is this?”, then I’d have succeeded.”10 He performed it in his opening sequence at the Esplanade, but I quickly noted his updated vocal treatment: he pushed a quarter of the song from the head register into the falsetto register. Nicknamed the Mesmeric Prince11 for his enchanting bass vocals and distinctive enunciation, the bold transitions between real and falsetto sounds were not fully successful. While Yoga was in defter control of his high pitches than ever, the song lost the original richness of voicing which better complemented the forcefulness of the song’s eclectic instrumentation of bass, drums, and wooden and electrical guitars. Nonetheless, it demonstrated his expanded vocal range, yet another sign of his continual evolution and immense versatility. Yet this supposed shift in creative direction turned out to be an inflection point as part of his maturation. The night’s next highlight was Worse Comes to Worst12, his debut Cantonese effort in Sell Like Hot Cakes, with intonation guidance from none other than Eason Chan. Yoga explained his intention of giving back to his fans’ persistent support during his conscription hiatus, by pushing his musical boundaries13. While he was tripped occasionally by the relentless switches in pitch, voicing, and amplitude, the effort would be considered hugely laudable even for a native speaker of the dialect. Yoga has stated that this song was chosen to encapsulate his thoughts14. Its lyrics included: “To be light-hearted / When it gets worse / Then you see the exalted”15. Such tenacious optimism might represent his understated response to the post-split tabloid allegations, but also reflects his calmer and more jovial demeanor onstage. The latter is no doubt influenced by his new love life; he was engaged with Kiki Ting in January after a romantic pre-proposal post on Facebook16 – another effort to include his fans. He has recounted in many interviews an episode in-camp, when the rare exposure to TV saw all the “brothers” rocking along to music. It was an image reminding him to stay true to his initial motivation: to touch the masses17. Worse Comes to Worst captures in a nutshell Yoga’s self-discovery and success in channeling his significant gifts to encompass and connect with listeners. The enforced absence in the army has reminded him that art is more than an expression of individuality. An inevitable question arises: Can Yoga still sing his melancholic songs with as much conviction and resonance? The answer came when he sang Early Sunset Clouds18, a heart-wrenching ballad inspired by a fatal car accident involving a young fan, comprising the lyrics “A strong forgiving spirit is just beyond me / The lonely years in future how can I digest / I did not give you two wings / Why did you have to take flight”19. In typically candid fashion, Yoga admitted that he no longer felt as much pain performing it now. Despite this confession, his vocals remained spot-on and his emotional delivery, as affecting as ever. From this concert, it appears that Yoga has avoided the cliché conundrum of “being true to self” and “pandering to public tastes”. The self – both private and artistic – is never static, and Yoga has managed to evolve through critical life moments and find the freedom to reconcile pursuits of innovation and popular appeal to his own satisfaction. The result is an artist who does not sulk when performing his most popular hit, Fairy Tale20, instead engaging the crowd in a mass sing-along and distinctively offbeat jokes before bringing it to its umpteenth conclusion. His newfound comfort is fittingly symbolized with the choice of Chinatown21 as encore: “The legend of returning home / I thought was not worth / But what I want most now / Is really this”22. Speaking of Sell Like Hot Cakes, Yoga said, “Apart from touching myself, I want my music to touch many different types of people. When I place this motivation in my heart, the musical process actually reverts to something more genuine, without relying on tricks. Sometimes I might try to make myself cool, but this time I feel very candid and exposed.”23 Indeed, he has found his home in both public and private life. For two hours – instead of the scheduled one-and-a-half – at the Esplanade, Yoga opened his happy and burgeoning heart to us. And spellbound, we rose – for the final few songs – to open ours to him, too. 1 “不過，由於近年我的個性比較開朗，所以要看見我臭臉的機率不高、也可能一不小心就會談笑風生⋯所以，一直期待我能像從前那樣很真性情、表演時臉很臭的樂迷朋友，我要先說明，開心迷人的我也是真實的唷。” Retrieved from Yoga Lin’s Facebook page, accessed March 30, 2017, https://www.facebook.com/yogalinmusic/posts/10153736252462563:0. 3 “林宥嘉台北签唱受封三冠王 陈奕迅送生日祝福,” last modified July 4, 2016, http://music.yule.sohu.com/20160704/n457666223.shtml. 7 “林宥嘉 – 電視/電影原聲帶專輯,” accessed March 30, 2017, https://zh.wikipedia.org/wiki/%E6%9E%97%E5%AE%A5%E5%98%89#.E9.9B.BB.E8.A6.96.2F.E9.9B.BB.E5.BD.B1.E5.8E.9F.E8.81.B2.E5.B8.B6.E5.B0.88.E8.BC.AF. 10 “如果有人听完问‘这是什么鬼东西’，我就成功了。” Retrieved from “林宥嘉：另外那条路是错的吗？” last modified June 23, 2014, http://ent.sina.com.cn/y/m/2014-06-23/17154163583.shtml. 13 “邀陈奕迅做粤语发声指导 林宥嘉携粤语新歌表白歌迷,” last modified August 21, 2016, http://news.takungpao.com/mainland/topnews/2016-08/3359764.html. 14 “邀陈奕迅做粤语发声指导 林宥嘉携粤语新歌表白歌迷,” last modified August 21, 2016, http://news.takungpao.com/mainland/topnews/2016-08/3359764.html. 16 Yoga Lin’s Facebook page, accessed March 30, 2017, https://www.facebook.com/yogalinmusic/?hc_ref=PAGES_TIMELINE&fref=nf. 17 “林宥嘉無奈吐人生低潮！「藝人會被淡忘」心酸曝焦慮.” last modified July 11, 2016, http://star.ettoday.net/news/733151. 23 “这一次主要就是想要我的音乐除了感动自己以外，可以感动很多不同的人。当我把这个动机放到心里，反而做音乐时更返璞归真，不会想要故弄玄虚。因为有时可能做音乐想要把自己做得很酷，但我觉得这次很坦白很赤裸。” Retrieved from “林宥嘉谈新专辑：军队生活成为创作动机,” last modified September 1, 2016, http://ent.sina.com.cn/y/ygangtai/2016-09-01/doc-ifxvqcts9117009.shtml. ET Today. “林宥嘉無奈吐人生低潮！「藝人會被淡忘」心酸曝焦慮.” Last modified July 11, 2016. http://star.ettoday.net/news/733151. Sina. “林宥嘉：另外那条路是错的吗？” Last modified June 23, 2014. http://ent.sina.com.cn/y/m/2014-06-23/17154163583.shtml. Sina. “林宥嘉谈新专辑：军队生活成为创作动机.” Last modified September 1, 2016. http://ent.sina.com.cn/y/ygangtai/2016-09-01/doc-ifxvqcts9117009.shtml. Sohu. “林宥嘉台北签唱受封三冠王 陈奕迅送生日祝福.” Last modified July 4, 2016. http://music.yule.sohu.com/20160704/n457666223.shtml. Takungpao. “邀陈奕迅做粤语发声指导 林宥嘉携粤语新歌表白歌迷.” Last modified August 21, 2016. http://news.takungpao.com/mainland/topnews/2016-08/3359764.html. Wikipedia. “林宥嘉 – 電視/電影原聲帶專輯.” Accessed March 30, 2017. https://zh.wikipedia.org/wiki/%E6%9E%97%E5%AE%A5%E5%98%89#.E9.9B.BB.E8.A6.96.2F.E9.9B.BB.E5.BD.B1.E5.8E.9F.E8.81.B2.E5.B8.B6.E5.B0.88.E8.BC.AF. Yoga Lin’s Facebook page. Accessed March 30, 2017. https://www.facebook.com/yogalinmusic/?hc_ref=PAGES_TIMELINE&fref=nf. Yoga Lin’s Facebook page. Accessed March 30, 2017. https://www.facebook.com/yogalinmusic/posts/10153736252462563:0.